A rare painting by the ill-fated Dutch artist Johannes Torrentius (1589 - 1644). A member of the underground religious sect, the Rosicrucians, he was jailed for twenty-two years by the Authorities. 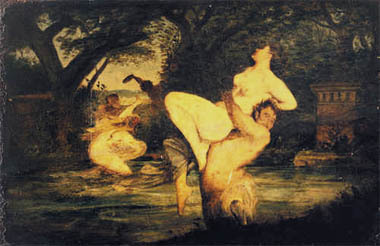 Fauns and Nymphs entered Charles l of England's collection when the artist escaped there, and bears the ruler's seal on the rear. Returning to Holland Torrentius was again arrested and died in prison.